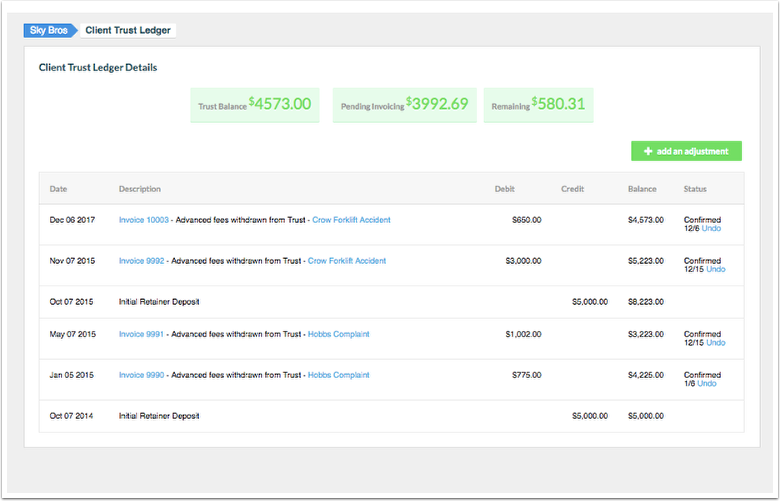 Rocket Matter Knowledge Base Trust Accounting How to make an adjustment to a clients trust ledger. 1. Click on the client trust ledger balance. 3. Click "Add an adjustment". 4. Choose the type of adjustment, date, amount, write a description and click 'add'. Credit adjustment: A positive credit line item which is added to the trust ledger for purposes such as carrying a positive balance over from a previous application, correcting an error or applying any other miscellaneous credit adjustments. Debit adjustment: A line item deduction which is added to the trust ledger for purposes such as carrying a negative balance over from a previous application, correcting an error or applying any other miscellaneous debit adjustments. If you manually add a debit adjustment to record a negative balance from a previous application and have applied an interest rule, interest will not apply to these entries. Interest can only be applied to fees and/or costs. Rocket Matter does not include interest on a debit adjustment. Credit and debit adjustments will appear as line items on your invoices. Prev: How to run an invoice for one matter and apply trust funds.